Who dare climb the Tower of Song? I regularly listen to CBC Radio’s Q, and one of the things you learn quickly is that host Jian Ghomeshi is a certifiable David Bowie nut. Not a bad thing, but don’t expect him to be unbiased. Back in March, he got into a debate with CBC Radio 2 host Tom Power about a cover of Bowie’s classic song, “Heroes.” The normally cool and composed Ghomeshi was unusually animated, even angry about the version by the Wallflowers for the 1998 film Godzilla. Power, to Ghomeshi’s disbelief, preferred the version by Jakob Dylan and company. D’oh! 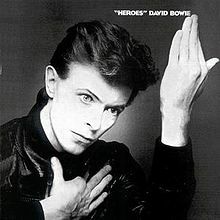 David Bowie wishes his “Heroes” was more like the Wallflowers’ — in an alternate universe. To me, it’s no contest. It’s Bowie’s song (well, Bowie and Brian Eno’s). I won’t get into the debate itself though. For that, you can listen to the Q blog. What I was more interested in was the topic of cover versions and how possessive listeners can become of original, authentic versions of songs. Way back when, popular music meant tunes that people would get to know through sheet music to buy and play at home. With the growth of the recording industry, the music itself, not the transcriptions, became the product. In other words, you bought a version that somebody had performed for you. In the early decades of recorded music, it was commonplace for singers or musicians to offer their interpretations of well-known songs. This was stock in trade for most early jazz, as the performers picked songs, often from movies or Broadway musicals composed by the factory that was Tin Pan Alley, which they would then interpret. Even in the early days of rock and roll, tunesmiths like Jerry Leiber and Mike Stoller cranked out hits like “Hound Dog.” You could then buy a Big Mama Thornton recording of the R&B tune, or one by this white kid from Tupelo. Elvis something. Bob Dylan and the Beatles changed everything. The performers themselves increasingly became their own composers, or vice versa. Before long, the way the public experienced a song was not simply from a recording but the recording. Sure, for a while, it was still a regular thing for performers to cover their peers’ songs, even if the song was still fresh in everyone’s ears, e.g. Jimi Hendrix tackling Dylan’s “All Along the Watchtower,” or Santana scoring a hit with Fleetwood Mac’s “Black Magic Woman” (augmented by jazz guitarist Gabor Szabo’s “Gypsy Queen”). For a few years, you still had the occasional band like Three Dog Night that followed the old model and scored massive hits by covering songwriters like Hoyt Axton, Laura Nyro and Randy Newman. Their cover of “Mama Told Me Not to Come” was okay, but hardly stands up to the Newman original. But that’s kind of my point with all of this. Don’t get me wrong. There are and will always be great cover versions, but most will still have to measure up against the original. Some, say the Talking Heads’ cover of Al Green’s “Take Me to the River,” become classics in their own right. Most don’t. Then you get the occasional phenomenon like Leonard Cohen’s “Hallelujah,” an amazing song with many fine versions but which might need to be put on ice for a while. As a Canadian, I know I’m supposed to prefer k.d. lang’s or Rufus Wainwright’s by default, but I don’t. I like them fine, but the late Jeff Buckley’s is my favourite. He played these tragic broken chords with lots of reverb. It almost sounds like some old 1950s doo-wop record. It’s one of the most heart-breaking things I’ve ever heard. It’s a small masterpiece, and to these ears, maybe the greatest cover song ever recorded. Wonder if Jian Ghomeshi or anyone wants to debate that question. Didn’t know Mama Told Me Not to Come was a Newman song, I love Three Dog Night’s version, which, lo this many years, I assumed was the original. I also agree Bowie’s original is better than the Wallflowers and you are dead on right about Mr. Buckley’s version of Hallelujah. Another nice blog entry.